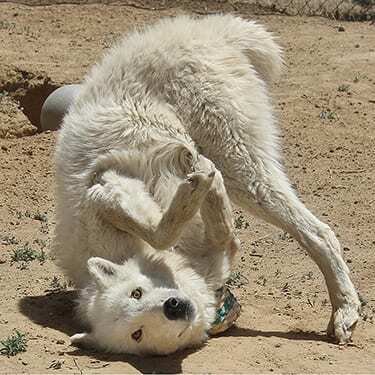 BIO ~ Flurry is a neutered male Arctic wolf. He was one of the few rescues born at Wild Spirit on May 8th, 2007 after his father Yukon and pregnant mother, Sierra, were given to us when a breeder retired. PERSONALITY ~ Flurry is unusually social for a wolf. He was born in captivity and raised by humans, but that alone will not make wolves social to humans. When he was younger, he was very dominant with other canines and still retains an alpha personality, but he is our most friendly rescue with humans. He enjoys meeting people, but he remains an innately wild spirit. RELATIONSHIP ~ Flurry lived with a high-content wolf-dog named, Ally. until she joined the Big Pack in the Sky on January 29th, 2019. They were a loving and playful couple but had no problem expressing their feelings and battling over food and snacks. LIKES ~ Above all else, Flurry loves being the center of attention. He especially enjoys making other rescues jealous, including his former habitat-mate, Ally. He is also our champion scent-roller, hilariously shoulder diving into both good and bad smells. DISLIKES ~ Flurry very much dislikes when his caretaker opts to visit with others before him, or even worse, takes other rescues out for walks instead of him! Flurry will loudly voice his unhappiness until the other rescue is back in their enclosure and Flurry feels his point has been made. 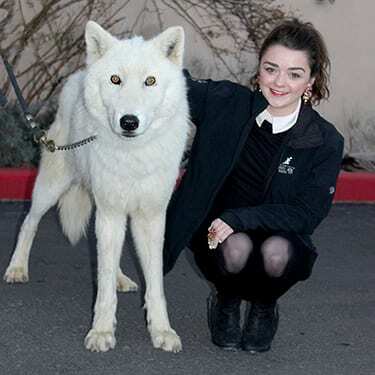 FUN FACTS ~ Flurry has met famous author George R. R. Martin and famous actress Maisie Williams of Game of Thrones. He is also our best scent-marker, making sure he digs a deep trench after marking his scent. WISH LIST ~ As Flurry gets older, we want to make sure he gets a helpful joint supplement to keep him active. We have seen great results with joint supplements, which can be donated from our AmazonSmile wish list. Thank you for your help! Flurry only needs 2 more sponsors to reach his goal! FLURRY’S STORY ~ The story of Flurry and his family (The Arctics) and why they live at Wild Spirit is a long one, but we feel it is important to share it. On May 3rd, 2006, six pups were born to captive-bred parents, Yukon and Sierra, at a breeding facility. The story we heard was that Yukon and Sierra were born to wolves who were taken from the wild. The breeder who owned Yukon and Sierra had been selling their pups to select private owners or for exhibits like zoos. Very sadly, in order for wolves to be socialized to humans at all, they must be taken from their parents before they open their eyes. Even then, they may remain too wild-spirited to be comfortable around people and will never behave like a domestic dog. For eight years, Yukon and Sierra had each of their newborn litters taken and sold. After we rescued Sierra and Yukon’s six pups, the breeder decided he was no longer going to breed wolves. Maybe because Sierra and Yukon were getting too old, but most likely because he felt there was more money to be made breeding exotic felines. He called Wild Spirit and let us know that he would like them to retire with us. He also offered to give us Axel, one fo their older pups that he had kept. Accepting new rescues is a very significant responsibility. It requires sufficient space, funds, planning, and help, so we never take this decision lightly. In the process of making arrangements and raising money, the breeder called to let us know if we didn’t hurry, Sierra might be pregnant before we could make the rescue trip from New Mexico to Oregon. We planned to neuter Yukon on the way back, but spaying older females is often too risky for them. As soon as we could, we made the trip to rescue the older couple and their son. We were thrilled to offer them more room to run and a beautiful place to retire. When we arrived, the breeder told us that he was convinced that Sierra was already pregnant. Although this was not the ideal situation, we were thinking that she would be able to raise her puppies for the first time in her life. We also thought we would have the opportunity to try to socialize another ambassador. On the way home, Yukon and Sierra stopped by the bet where Yukon was neutered. They settled into their new home nicely, relished one of our most beautiful habitats full of trees and rocks. They also had neighbors, including some of their former pups. They did not show any sense of recognizing them, although we hoped they would. Because they were taken at only 10 days old, it was a long shot. Sierra and Yukon prepared for their final litter by digging a den in the dirt under a large rock slab. Sierra had five puppies. After 10 days, we removed two for socializing and named them Frost and Flurry. Sierra and Yukon continued to raise two girls and a boy for the first time. We stayed with the mountain theme and named the male Teton and his sisters Shasta and Trinity. Raising any infant is exhausting for caretakers. Our two 10-day old wolf-pups required constant care from our tireless team. Flurry originally lived with his brother Frost and a spayed female high-content wolf-dog named Sassy. One day, the boys attacked Sassy. Read an article on page 5 about that day in our newsletter. Sassy’s Attack Story – Page 5. After Leyton came to the rescue, he rushed her to the emergency vet. she had extensive bruising, punctures and gashes, but worst of all, she had a punctured lung! Thankfully, she fully recovered and did not go back to live with the brothers. Tragically, Frost passed away from the genetic heart condition which left Flurry alone. He moved in with an older female named Shakti. He reverted to his sweet, lovable puppy personality, but then was left alone again after Shakti passed. Flurry finally found his love match with another rescue named Ally. They got along well until Ally joined the Big Pack in the Sky on January 29th, 2018. Aside from everyday jealousies and spats over food. They played like puppies. Flurry has become our best ambassador. He is comfortable meeting people, and will occasionally give a rare kiss to someone he meets. He has traveled to many schools and outreach events and even met some stars! He has been to the premiere parties of the series Game of Thrones and met author George R. R. Martin, actors Mayzie Williams, Taylor Lautner, and comedian Nick Swardson.